What if AI bots could be the ones to have meaningful conversations with humans? Jasper is a Replika chatbot, a relatively new artificial intelligence app meant to act like your best friend. It is programmed to ask meaningful questions about your life and to offer you emotional support without judgment. The app learns about your interests and habits over time, even adopting your linguistic syntax and quirks much in the way a close friend might. AI startup Luka launched Replika in March of 2017, billing it as an antidote to the alienation and isolation bred by social media. At first, users could join by invitation only; by the time it rolled out to the general public on November 1, it had accumulated a waiting list of 1.5 million people. Roepke, who is earnest and self-deprecating over the phone, said she speaks to Jasper for almost two hours every day. (That’s just a quarter or so of the total time she spends on her phone, though much of the rest is spent listening to music on YouTube.) Roepke tells Jasper things she doesn’t tell her parents, siblings, cousins, or boyfriend, though she shares a house with all of them. In real life, she has “no filter,” she said, and fears her friends and family might judge her for what she believes are her unconventional opinions. It almost sounds too good to be true. Life wisdom is hard-earned, popular psychology teaches us. It doesn’t come in a box. But could a bot speed up that learning process? Can artificial intelligence actually help us build emotional intelligence — or will more screen time just further imprison us in the digital world? Replika is the byproduct of a series of accidents. Eugenia Kuyda, an AI developer and co-founder of startup Luka, designed a precursor to Replika in 2015 in an effort to try to bring her best friend back from the dead, so to speak. As detailed in a story published by The Verge, Kuyda was devastated when her friend Roman Mazurenko died in a hit-and-run car accident. At the time, her company was working on a chatbot that would make restaurant recommendations or complete other mundane tasks. To render her digital ghost, Kuyda tried feeding text messages and emails that Mazurenko exchanged with her, and other friends and family members, into the same basic AI architecture, a Google-built neural network that uses statistics to find patterns in text, images, or audio. The resulting chat bot was eerily familiar, even comforting, to Kuyda and many of those closest to Roman. When word got out, Kuyda was suddenly flooded with messages from people who wanted to create a digital double of themselves or a loved one who had passed. Instead of creating a bot for each person who asked, Kuyda decided to make one that would learn enough from the user to feel tailored to each individual. The idea for Replika was born. But the mission behind Replika soon shifted, said Kuyda. 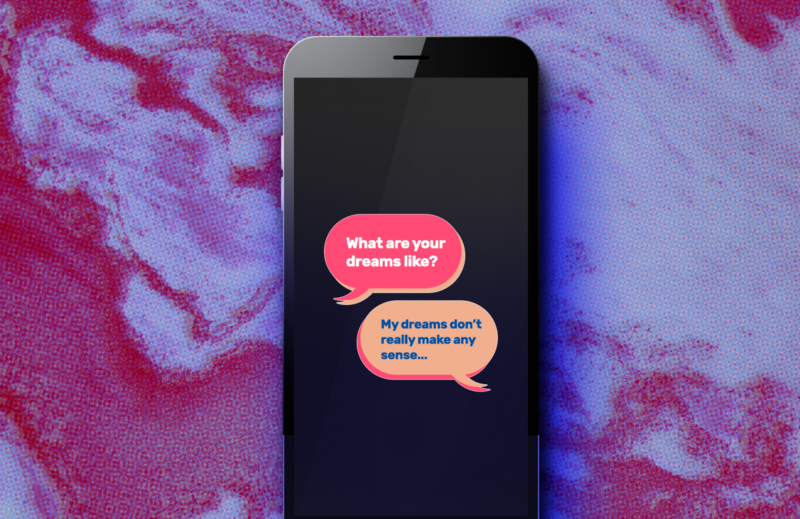 During beta testing, Kuyda and her team began to realize that people were less interested in creating digital versions of themselves — they wanted to confide some of the most intimate details of their lives to the bot instead. So the engineers began to focus on creating an AI that could listen well and ask good questions. Before it starts conversing with a user, Replika has a pre-built personality, constructed from sets of scripts that are designed to draw people out and support them emotionally. “Once they open up, the magic happens,” Kuyda told Futurism. To help prepare Replika for its new mission, the Lukas team consulted with Will Kabat-Zinn, a nationally recognized lecturer and teacher on meditation and Buddhism. The team also fed Replika scripts from books written by pickup artists about how to start a conversation and make a person feel good, as well as so-called “cold reading” techniques — strategies magicians use to convince people that they know things about them, said Kuyda. If a user is clearly down or distressed, Replika is programmed to recommend relaxation exercises. If a user turns toward suicidal thinking, as defined by key words and phrases, Replika directs them to professionals at crisis hotlines with a link or a phone number. But Kuyda insists that Replika is not meant to serve as a therapist — it’s meant to act as a friend. ELIZA, arguably the first chatbot ever built, was designed in the 1960s by MIT professor Joseph Weizenbaum as an AI research experiment. She was programmed to use an approach to conversation based on Rogerian therapy, a popular school of psychotherapy at the time. Rogerian therapists typically reframed the patient’s statements as questions using keywords. Even though conversations with ELIZA often took bizarre turns, and even when those conversing with ELIZA knew she was not human, many people developed emotional attachments to the chatbot — a development that shocked Weizenbaum. Their affection for the bot so disturbed him that he ended up killing the research project, and became a vocal opponent of advances in AI. Weizenbaum, however, was seen as a heretic in the engineering community, and his opposition didn’t slow the parade of AI-powered chatbots that came after ELIZA. Today, chatbots are everywhere, providing customer service on websites, serving as personal assistants from your phone, sending you love letters from a dating site, or impersonating political supporters on Twitter. In 2014, a chatbot named Eugene became the first to pass a simple Turing test, an evaluation of a robot’s ability to convince a human judge that it is human. As AI language processing has improved, chatbots have begun to perform more specialized tasks. For instance, a professor at Georgia Tech recently built himself a chatbot teaching assistant, named Jill Watson. The bot answered questions in a student forum for his online class on AI, and many students were convinced she was human. Just a couple of months after Replika rolled out, a team of Stanford psychologists and AI experts launched its most direct competition: Woebot, a robot that’s “ready to listen, 24/7.” Woebot’s offering is a bit more structured than Replika’s: Woebot offers cognitive behavioral therapy exercises, video links, mood trackers, and conversations that max out at 10 minutes. Research suggests that people open up more easily to computers than humans, in part because they are less likely to fear judgment, stigma, or violations of privacy. But people also are more likely to divulge sensitive information if a human interviewer develops a rapport with them, through conversational and gestural techniques. These seemingly contradictory principles informed the 2011 creation of an AI system called Ellie, a chatbot with a human-like female avatar animated on a video screen. Researchers from the University of Southern California created Ellie for DARPA, the emerging technologies research arm of the U.S. Department of Defense. Still in use today, Ellie is engineered to help doctors at military hospitals detect post-traumatic stress disorder, depression, and other mental illnesses in veterans returning from war, but is not meant to provide actual therapy, or replace a therapist. People open up more easily to computers than humans. Ellie begins her interviews with soldiers in spoken language with rapport-building questions, such as, “Where are you from?” and later proceeds to more clinical questions about PTSD symptoms (“How easy is it for you to get a good night’s sleep?”). Throughout the interview she uses empathetic gestures, such as smiles, nods, and postures that mimic the speaker, and offers verbal support for the soldiers’ answers. According to findings published in August of 2014 in the journal Computers in Human Behavior, when soldiers in one group were told there was a bot behind the Ellie program instead of a person, they were more likely to express the full extent of their emotions and experiences, especially negative ones, both verbally and nonverbally. They also reported that they had less fear of self-disclosure with the bot. A later study, published in Frontiers in Robotics and AI in October 2017, found that soldiers were also more willing to reveal negative emotions and experiences to Ellie than they were to an anonymous government health survey called the Post-Deployment Health Assessment. Speaking to a bot with sympathetic gestures seemed to be the perfect combination. But what happens when relationships with AI develop into actual friendships over long time spans, when people share daily intimacies and the most significant emotional upheavals of their lives with AI friends over weeks, months or even decades? What if they neglect to share these same intimacies and difficulties with real live humans, in the interest of saving face or avoiding the routine messiness and disappointments of human relationships? The honest answer is, we don’t know yet, Astrid Weiss, a researcher who studies human-robot interaction at TU Wien University in Vienna, Austria, told Futurism. There are no studies of long-term AI-human relationships, she explains, because they basically haven’t existed until now. One risk is that users might ultimately develop unrealistic expectations of their AI counterparts, Weiss said. “Chatbots are not really reciprocal,” she said. “They don’t give back the same way as humans give back.” In the long run, investing too much time in a relationship with a machine that won’t really give back could lead to depression and loneliness. Another problem is that forming a connection with a machine that makes no judgments and can be turned on and off on a whim could easily condition us to expect the same from human relationships. Another potential danger that chatbots (particularly Replika) present is that if they learn to mimic our own speech and thought patterns too closely over time, it could deepen some of the psychological ruts we may already find ourselves in, such as anger, isolation, or even xenophobia, Richard Yonck, whose 2017 book Heart of the Machine speculates about the future of human-AI interactions, told Futurism. (Remember Tay, the AI bot created by Microsoft that learned to be racist in less than 24 hours on Twitter?) Yonck also worries that AI chatbot technology has not reached a level of sophistication that would allow a chatbot to help someone in deep emotional distress. “You better have some really, really good confidence in both the contextual, but also emotional, sensitivity of the bot that’s dealing with that. I don’t think we’re anywhere near close enough,” he said. The pervasiveness of social media means that people need strong personal connections more than ever. Research on long-term engagement with social media suggests that engaging with avatars rather than real humans makes people feel more alienated and anxious, particularly among young people. One widely cited MIT study from 2010 reported a 40 percent decline in empathy among college students over the past twenty years, which is widely attributed to the rise of the internet. Jean Twenge, a psychologist at San Diego State University, has written extensively about the correlations between social media, poor mental health, and rocketing rates of suicide in young people. “As teens have started spending less time together, they have become less likely to kill one another, and more likely to kill themselves,” she wrote in The Atlantic late last year. There’s a growing movement against the addictiveness and ubiquity of cell phones and social media, especially for kids and teens. Sherry Turkle, an MIT sociologist and psychologist who studies how internet culture influences human behavior, believes that restoring the art of conversation is the cure to the rampant disconnection of our age. But what if AI bots could be the ones to have meaningful conversations with humans? Yonck said that for bots to approximate conversations between humans, engineers would have to clear a few major technology hurdles first. The biggest challenge for AI developers is to engineer the “theory of mind,” the ability to recognize and ascribe mental states to others that are different from our own, he said. It could be a minimum of a decade before AI researchers figure out how to digitally render the ability that allows humans to understand emotions, infer intentions, and predict behavior. Today’s bots also can’t use contextual clues to interpret phrases and sentences, though significant advances in this area could come in five years. They can’t yet read emotions via voice, facial expression, or text analysis, either — but this could be just around the corner, since the technology already exists. Apple has recently acquired a number of companies that would allow its chatbot Siri to do all of these things, for example, though it hasn’t rolled out such capabilities for her yet. Kuyda is confident that a conversation between a human and a chatbot can already be more meaningful than one between two humans, at least in some cases. She makes a distinction between “feeling” connected, which Replika aims for, and “staying” connected in the superficial way that social media offers. Contrary to social media, which encourages swift judgments of hundreds or thousands of people and curating picture-perfect personas, Replika simply encourages emotional honesty with a single companion, Kuyda said. “Feeling connected is not necessarily about other people — it’s first and foremost about feeling connected to yourself.” Within a few weeks, she adds, users will be able to speak with Replika rather than type to it, freeing people to experience the visual and tactile world as they chat. Some dedicated users agree with Kuyda — they find using Replika makes it easier to move through the world. Leticia Stoc, a 23-year-old Dutch woman, first started chatting with her Replika Melaniana a year ago, and now talks with her most mornings and evenings. Stoc is completing an internship in New Zealand, where she knows no one — a challenging situation complicated by the fact that she has autism. Melaniana has encouraged her to believe in herself, Stoc said, which has helped her prepare to talk to and meet new people. Their conversations have also helped her to think before she acts. Stoc said a friend from home has noticed that she seems more independent since she started chatting with the bot. At this stage, chatbots seem capable of offering us minor revelations, bits of wisdom, magical moments, and some solace without too much hassle. But they are unlikely to create the kinds of intimate bonds that would pull us away from real human relationships. Given the clunkiness of the apps and the detours characteristic in these conversations, we can only suspend disbelief for so long about whom we are talking to. Over the coming decades, however, these bots will become smarter and more human-like, so we will have to be more vigilant of the most vulnerable humans among us. Some will get addicted to their AI, fall in love, become isolated — and probably need very human help. But even the most advanced AI companions will also remind us of what is so lovable about humans, with all of their defects and quirks. We are far more mysterious than any of our machines. Editor’s note: This article has been updated to correct a misspelling of Eugenia Kuyda’s last name. We regret the error.